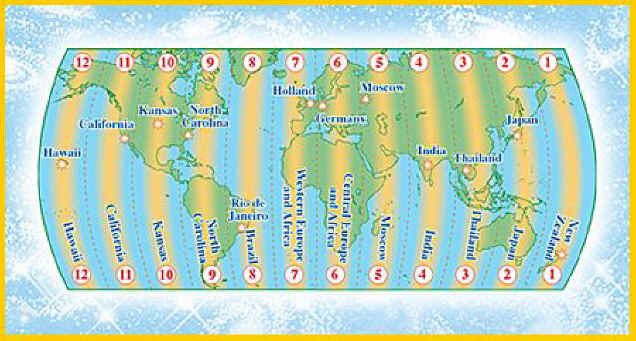 In July 1996 Maharishi Mahesh Yogi founded Maharishi's Global Administration through Natural Law with 12 Time Zone Capitals around the world -- so that the golden hue of Heaven on Earth will dawn with the sunrise in every time zone, and every nation will enjoy a greater good fortune day by day, around the year, around the globe. Now that the total knowledge of Natural Law is easily available in its completeness to human awareness through Transcendental Meditation, all problems and suffering can be brought to an end. Maharishi's Global Administration through Natural Law has quietly introduced the element of Natural Law into administration through national law so that the total potential of the evolutionary power of Natural Law spontaneously supports every level of national administration. Perfect Education which delivers the 'fruit of all knowledge' to everyone. Prevention-oriented health care for a disease-free society through Maharishi's comprehensive Vedic Approach to Health. A strong, stable economy based on the pattern of Nature's Economy, which functions through the Principle of Least Action for progress without fatigue. Conflict-free politics and a problem-free government -- national law supported by Natural Law that governs the ever-expanding universe with perfect order. Through membership in Maharishi's Global Administration through Natural Law, the family of nations will rise to a new world order of peace and happiness. The world is my family.